Former trustee brings associates to post for Walk and Talk tour | Command and General Staff College Foundation, Inc.
On March 7, the CGSC Foundation hosted Tim Carlin, a former member of the Foundation board of trustees, and four of his executive friends for a visit to Fort Leavenworth and the U.S. Army Command and General Staff College. From left: Tim Vance, George Hersh, Dan Carier, David Stry and Tim Carlin. Foundation President/CEO Rod Cox first led the group on a short tour of Fort Leavenworth where they made stops at the Buffalo Soldier and Berlin Wall monuments to discuss the background and history of their presence on the fort. He also took them past some of Fort Leavenworth’s historic brick homes, including the “Rookery,” which was formerly the home of General MacArthur and his mom Pinky, and which also holds the distinction of being the oldest continually habited home in Kansas. Across from the Rookery, Rod discussed the historic main parade field where graduations are still conducted today. Next stop on the Fort tour was at the Landing/Trails West wagon wheel cuts at the Santa Fe Trail route. The group’s final stop was the National Cemetery where they learned about some of the famous Soldiers buried there. After the driving tour of post, the group visited the Lewis and Clark Center. The Lewis and Clark Center is the home of the U.S. Army Command and General Staff College, a world-class facility that provides 96 state-of-the-art classrooms for CGSOC classes of nearly 1,200 students each year. The group took photos in the MacArthur room, and perused the Fort Leavenworth Hall of Fame, as well as Eisenhower auditorium. They also toured through the halls and viewed the art and gift collection presented by international officers and others, and viewed the stained-glass windows that previous CGSOC classes donated to the College. Professor Mark Wilcox from CGSC’s Department of Joint, Interagency and Multinational Operations provides the group with an information briefing on Russian-U.S. security interests during their visit to CGSC March 7, 2019. The group then toured the International Hall of Fame where they discovered the importance of the international program, and the relationships that are built that can facilitate diplomatic efforts in the future. They learned more about the sponsorship program associated with the international program that cements long lasting friendships between the officers and individual sponsor families in the greater Kansas City area. One of the CGSC faculty teaching teams, led by Dr. Dave Anderson, briefed the group on the composition of the staff groups, the course curriculum, and the context of the exercise. The group observed part of the exercise rehearsal, watching as the students conducted a rock-drill for the movement phase of their selected course of action under the supervision of the faculty. The group gained an appreciation for the level of detail, academic rigor, and expertise of both the students and the faculty. 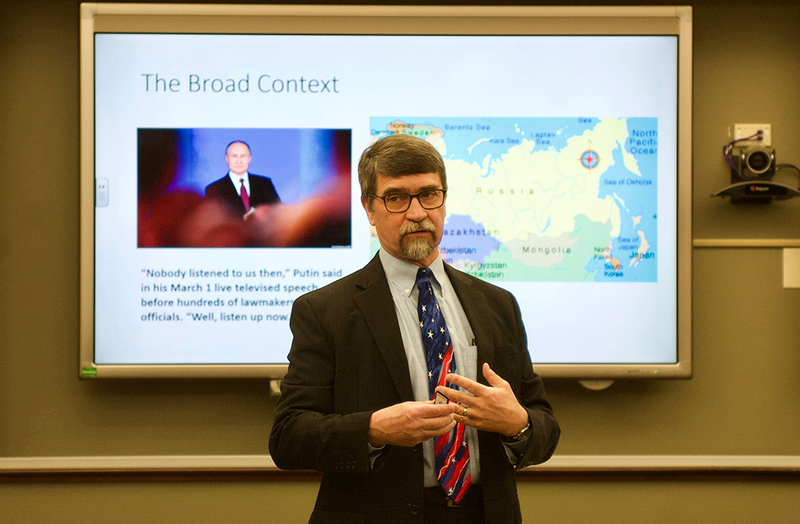 The final activity was a classroom presentation titled, “Russia – A Great Power Rival,” and follow-on discussion with Professor Mark Wilcox. Wilcox, a faculty member of CGSC’s Department of Joint, Interagency and Multinational Operations, is an expert on national security policy formulation and is one of CGSC’s foremost experts on Russia and the former Warsaw Pact. Over lunch the group listened to Professor Wilcox remarks on Russia’s international statecraft and engaged in an informative discussion on a wide variety of U.S.-Russian security issues. 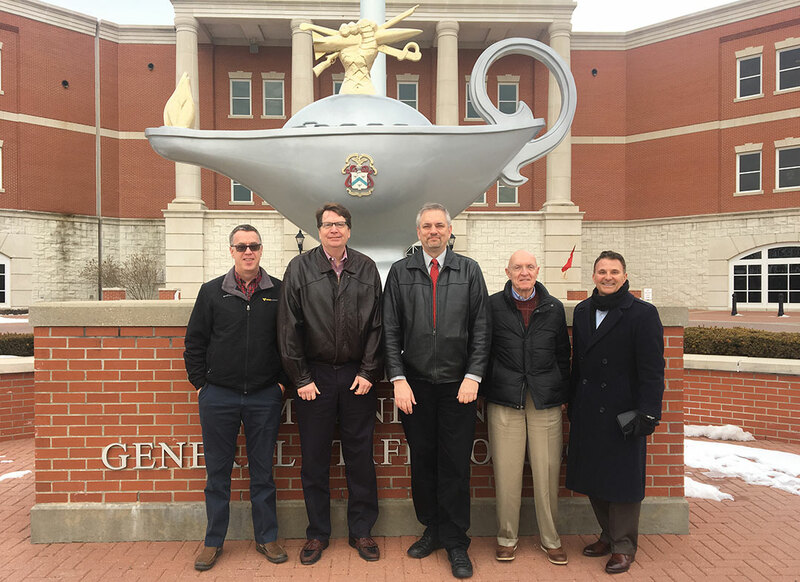 The CGSC Foundation was pleased to host Carlin’s group and to share with them just a few of the outstanding things happening on a daily basis at Fort Leavenworth and the U.S. Army Command and General Staff College. 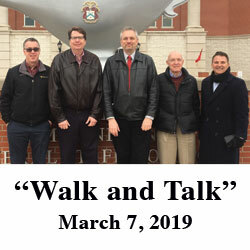 To learn more about the Foundation’s “Walk and Talk” program, contact Joan Cabell, the CGSC Foundation director of development. – joan@cgscf.org.